The Akamina Parkway in Waterton Lakes National Park (a.k.a. Cameron Lake Road), is a gorgeous 9.4 mile drive through an amazing canyon that ends at the incredibly scenic Cameron Lake. The turn-off to the Akamina Parkway is along Highway 5, just south of the Waterton Lakes National Park Visitor Center. 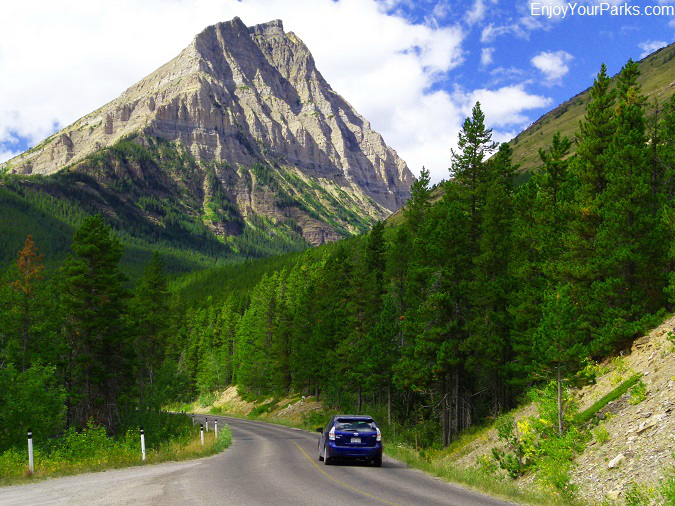 As you drive along this scenic parkway, you will be surrounded by towering mountains, as well as a gorgeous pine forest. 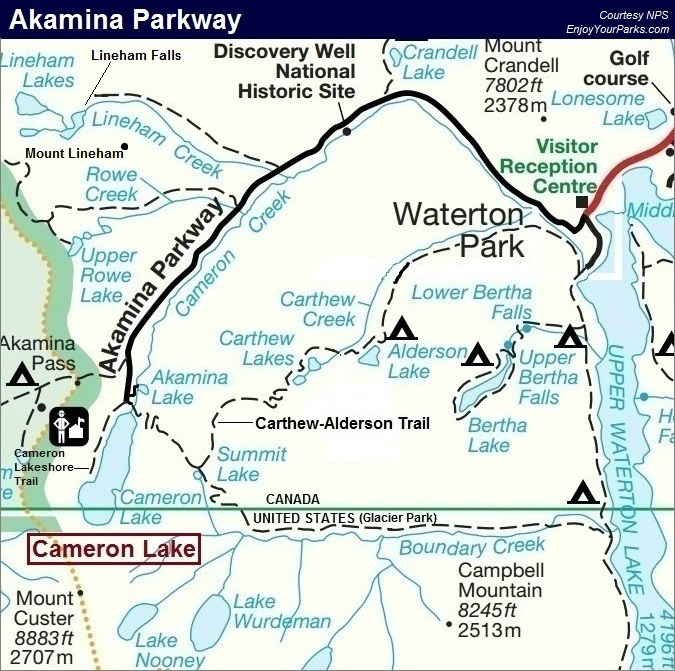 The Akamina Parkway in Waterton Lakes National Park follows Cameron Creek up the Cameron Valley all the way to Cameron Lake. Initially the road takes you through a very narrow canyon, and then the terrain opens up into a large, U-shaped glacial valley the rest of the way to Cameron Lake. You will more than likely see wildlife on or near the Akamina Parkway. 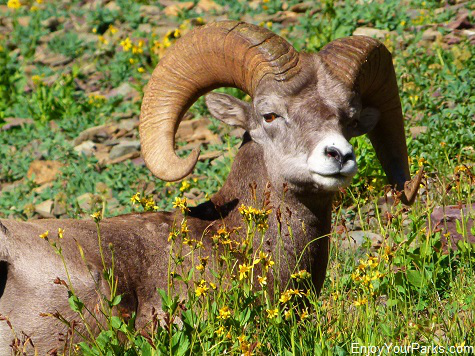 Bighorn sheep are often seen in the cliffs along the first several miles of the parkway, and sometimes you'll see a band of bighorn sheep actually on the road, so please drive slow and keep an eye out for animals on the parkway. You also may see moose deer and black bear, and the far shores of Cameron Lake are prime grizzly bear habitat. Shannon heading back to our car that's parked along the Akamina Parkway after a great day of hiking in Waterton Lakes National Park. Akamina Parkway with Mount Lineham in Waterton Lakes National Park. 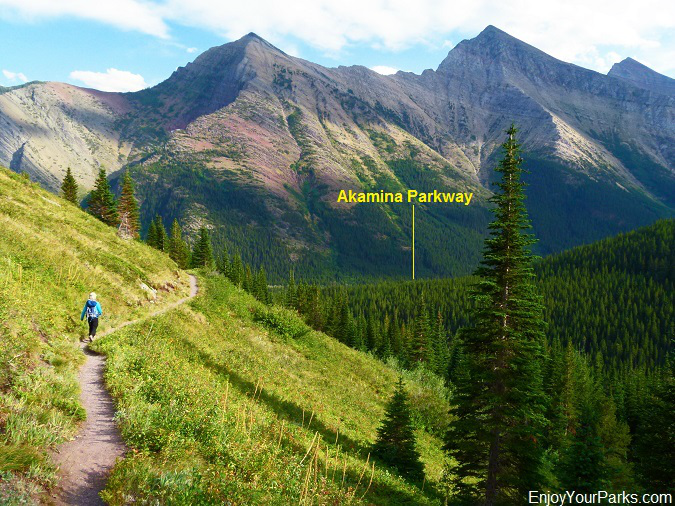 There several points of interest along the Akamina Parkway, such as the Discovery Well National Historical Site, Oil City and Little Prairie, as well as several trailheads to some extremely popular hikes in Waterton Lakes National Park. explorations yielded nothing useful, and when oil was discovered in the Turner Valley Field in 1914, the search for oil in the Waterton Lakes National Park area ended. All that remains of a small town that was anticipating an oil boom in the Cameron Valley is the foundation of a hotel that was never built. There is a plaque that commemorates this small boom town that went bust. In late fall, the Akamina Parkway is closed at Little Prairie, which is 7.5 miles from the beginning of the Akamina Parkway at Highway 5, or 1.9 miles before Cameron Lake. The road beyond this closure is then used by Nordic skiers or snowshoers for the entire winter season. 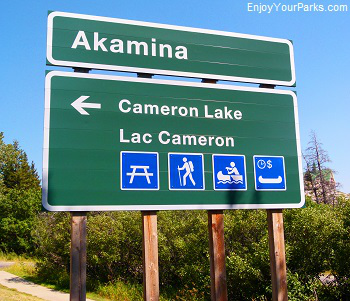 The most common access to the Akamina-Kishinena Provincial Park of British Columbia is found just before you reach Cameron Lake, at the Akamina Pass Trailhead. Cameron Lake is one of the most popular destinations for visitors in Waterton Lakes National Park. 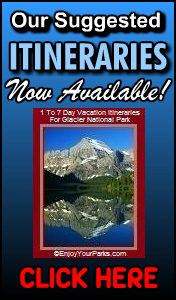 also boat, canoe and kayak rentals, as well as trailheads to several popular hikes. 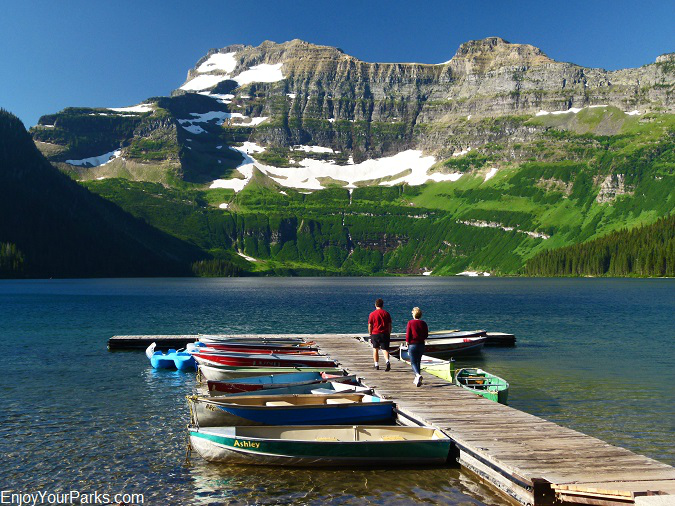 Cameron Lake is without question one the most popular destinations for visitors of Waterton Lakes National Park. Click Here for more details on Cameron Lake. The Akamina Parkway not only is a "must do" scenic drive through the heart of Waterton Lakes National Park, but it also allows hiking enthusiasts to access several popular trails, such as the Crandell Lake Trail, Lineham Falls Trail, Rowe Lakes, Lineham Peak, Tamarack Trail, Akamina Pass Trail, Akamina Ridge, Akamina Lake, Carthew-Alderson Trail and Cameron Lakeshore Trail. Below is a brief description of these popular trails. Click each link for more details. The Crandell Lake Trail is a short 0.7 mile (one way) trail takes you to Crandell Lake, which rests on a low saddle between Mount Crandell to the east and the Ruby Ridge to the west. There is the Crandell Lake Campground located here, and you will need a permit and reservation to stay here overnight. The Lineham Falls Trail (a.k.a Lineham Creek Trail) takes you up to a vantage point where you can get a good look at the 410 foot Lineham Falls. The hike to and from the falls is quite scenic, and makes the hike worthwhile even when Lineham Falls is barely flowing later in the summer season. The trailhead to Rowe Lakes Trail is located at about 6.5 miles up Akamina Parkway, and takes you to Lower Rowe Lake and Upper Rowe Lake. Near Lower Rowe Lake is a junction that connects with the Tamarack Trail, as well as access to the lofty summit of Mount Lineham. The Akamina Ridge Trail is basically an old road, and is not that particularly scenic, HOWEVER, in just one mile, this trail takes you into the Akamina-Kishinena Provincial Park of British Columbia, where you can then hike to Wall Lake, Forum Lake, and our favorite... Akamina Ridge. 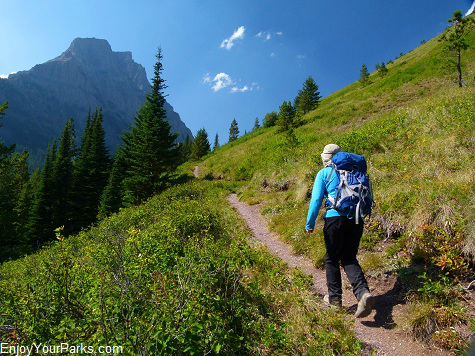 The Akamina Lake Trail is a short hike to a sub-alpine lake. Akamina Lake is not the most beautiful lake in Waterton Lakes National Park, but is still quite scenic and only takes about 10 minutes to get there. A great hike for a young family. 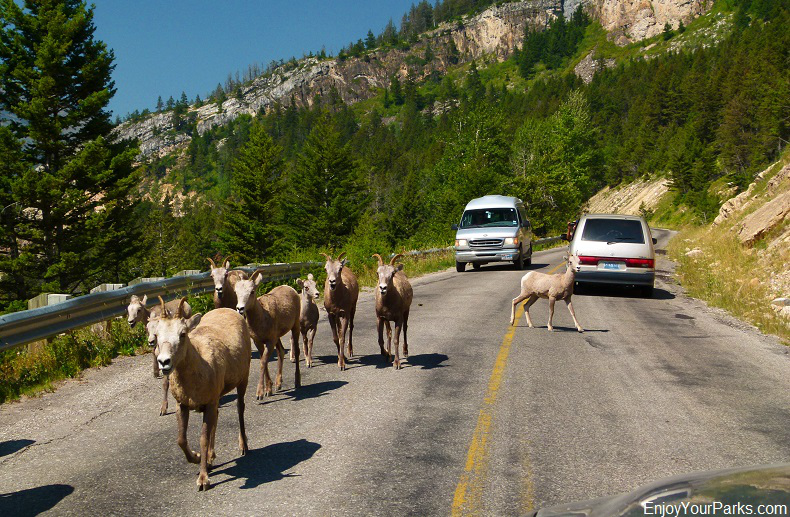 The Akamina Parkway in Waterton Lakes National Park is one of the most visited areas of the park. With fascinating pullouts, abundant wildlife, incredible hiking opportunities and magnificent scenery the entire way, the Akamina Parkway is definitely among the "Top Things To Do in Waterton Lakes National Park", and we highly recommend that you take some time and explore this wonderful area.